In the month since the new H1N1 flu virus first emerged, public health officials have come a long way in profiling the disease. But several key questions remain, including, How afraid should we be? The H1N1 flu seems a far cry from the mass killer it was feared to be when it first emerged in Mexico in April. While it has since infected more than 12,000 people in 43 countries, including more than 6,500 in the U.S., it has so far killed just 86 victims. 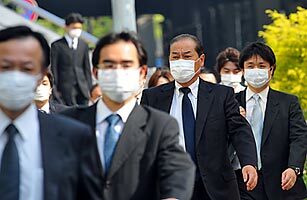 Health officials are still on high alert, however; the disease continues to spread, with a batch of new cases in Japan in mid-May that could be enough to prompt the World Health Organization (WHO) to declare an official pandemic. New Yorkers can rest easy  Mayor Michael Bloomberg has said that "turning prisoners loose in the streets of the city is not something we plan to do." But a month after the H1N1 virus first grabbed the world's attention, we're still pondering the essential question: how afraid of swine flu should we be? The answer is that we may not know for weeks or months  the world has been hit with pandemics before, but what is happening now is unprecedented. "For the first time in humanity, we are seeing, or we may be seeing, pandemic influenza evolving in front of our eyes," said Margaret Chan, the director-general of the WHO, at the agency's annual meeting on May 18. That may help explain why the global response feels a bit disjointed. Different countries have different ways of keeping up with an evolving epidemic: while the Hong Kong government has been quarantining for 10 days everyone who has been in contact with a confirmed flu patient, local governments in the U.S. are still debating whether schools with infections should close. Meanwhile, drug companies say they could produce nearly 5 billion doses of H1N1 vaccine in a year, if pressed  but there's still no decision yet on whether to go forward, or exactly how the vaccine might be distributed. Those are just a few of the questions still surrounding the H1N1 outbreak. Here are five more that need answers. Next How Deadly Is H1N1?